raja and rani: Our first Pop Up Shop! 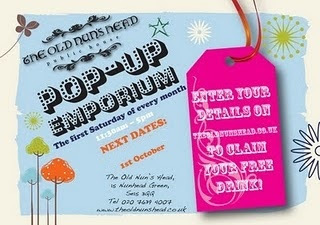 On Saturday 1st October , Raja and Rani will be taking part in the monthly Pop-Up Emporium at the lovely Old Nun's Head pub in Nunhead, SE15. Come along and say hello! We'll be selling goodies from our first collection of handcrafted throws, cushion covers and silk scarves. There will be a whole range of other stalls ranging from handmade goods, arts and crafts and of course, food and beer so you can chill out all afternoon! We'll be there from 11.30am-5.00pm. Watch this space for further info as we get prepared!